Updated Friday February 13, 2015 by South Montgomery Girls Softball League. 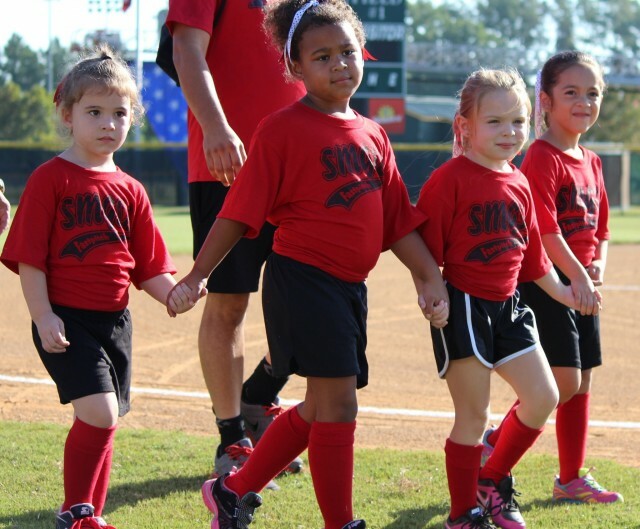 SMGSL offers a BLASTBALL!® division for players aged 3 to 4 years old. BLASTBALL!® is an excellent introductory game for beginner boys and girls who wish to play softball or baseball. The structure of the games allows for more action for a younger players short attention spans. More kids get to be involved which helps them develop and retain an interest in the sport. The game is safe and uses a foam bat and ball. BLASTBALL!® teaches the basic softball/baseball fundamentals of hitting, throwing, and fielding while emphasizing the importance of teamwork and sportsmanship. Eligible players must be 3 years old by the 1st game of the current season, and must not be older than 4 years old by the first practice of the season. Playing field will consist of a 1st base loaded with a horn and a home plate where the batter will hit from a “Tee”. All defensive players will line up at least 40 feet away from home plate. A distance marker should be set at 10 feet from home plate. Any ball hit past the distance marker and inside the foul lines will be considered a fair ball and the batter shall advance to 1st base. 1st base will be set at a distance of 30 feet from home plate. All players will be supplied with a team t-shirt. The home team’s coach will be responsible for setting the field up for their game. If the game is called because of darkness or inclement weather, it will be declared a complete game if twenty -five (25) minutes are completed prior to the stopping of play. No score or win/loss records will be kept. There will be no score keeper, however an SMGSL Board Member will be at the fields should you have any questions. Each BlastBall team must have two (2) coaches on the field of play at all times. No offensive player will be allowed on the field unless he/she is wearing a batting helmet. Each team will bat its entire roster in each inning one complete time, which will constitute a half inning of play. Each turn at bat the batting order will be reversed. (example: if a player bats last in the 1st inning he/she will bat first in the next inning). When at bat, the object is to hit a fair ball, reach the base and sound the horn before the defensive team fields the ball, holds it above their head and yells “Blast”. Each batter will return to the dugout after running to 1st base. Each batter will receive a maximum of six (6) swings in which to hit a fair ball. A fair ball is any ball between the foullines and past the 10-foot distance marker in front of home plate. When on defense, all players will play a defensive position at least 40 feet from home plate. No player shall play catcher. Defense will consist of 1 pitcher and at least 4 infielders. The home team will be responsible for setting up the field for the game. Coaches will also serve as umpires while on the field. Game 7 – Home Base will be added, and the kids will run all of the bases before returning to the dugout.